German soldiers in a trench at Stalingrad. Ideally, German defensive doctrine called for the defensive trenches around a fixed position to be at a distance from the structure the soldiers lived in, and away from buildings to provide flank protection to the main defensive objective of an attack. Note the curve to this trench; this was to prevent mass casualties from artillery or grenades. The Maschinengewehr 34 (Machine Gun 34, or MG34) fired 7.92mm (.31 caliber) ammunition. 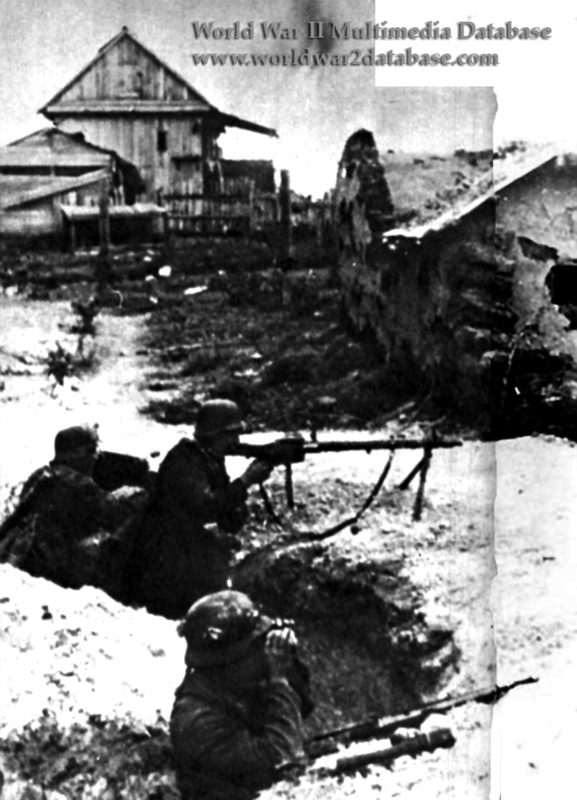 Originally the MG34 in a bipod configuration (like the one shown here) used a drum magazine, but most soldiers simply belt-fed the weapon as it consumed ammunition at up to 1,200 rounds per minute.